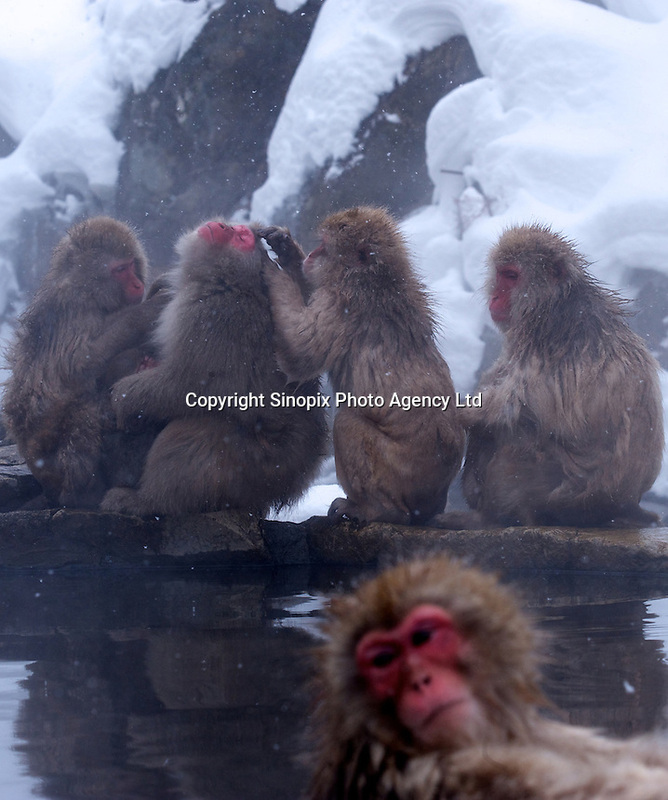 The Snow Monkeys of Jigokudani groom next to a hot spring in a valley known as Hell's Valley, north of Nagano city, Nagano Prefecture Japan. The Japanese Snow Monkeys live in the icy Japanese highlands, farther north than any other monkey in the world. With their double layer of thick fur, that resembles a furry hooded top on the younger members, they are able to withstand temperatures as low as of minus 15 degrees centigrade. According to an official at the wild-life park, the bathing ritual of the Snow Monkey's did not begin until 1964, when a young monkey jumped into the hot pool chasing chestnuts, liked the feel, and stayed to bathe. Many other youngsters followed and were soon followed by the adults. With the freezing winter the naturally heated bathes were soon adopted as part of monkey life. The Japanese Macaque is an extremely intelligent animal that has adapted to it's surroundings all over the country. While the Snow Monkeys bathe in the hot springs, other macaques are know to use salt water to flavor roots and others have learned to separate grain from mud by mixing it with water. .